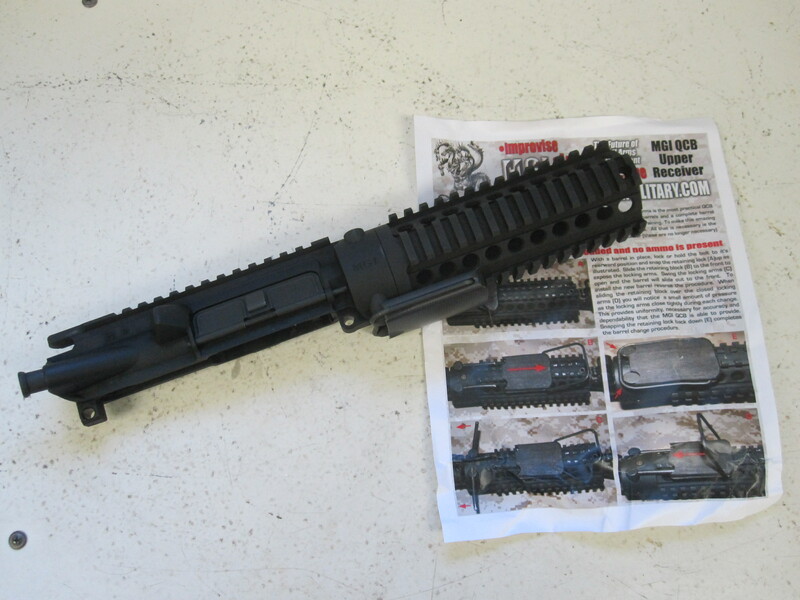 For years now I’ve always been intrigued by MGI’s QCB upper receiver. The ability to quickly swap barrels without having to change optics, carriers etc seems like a good idea. But alas, my research for reviews was unsuccessful, I couldn’t find anyone that was actively using one and had some reviews or thoughts on it. I contacted Cory at MGI Military, he agreed to send me a unit to review. If I didn’t like it, I was free to return it at any time. And the price was right as well. So I agreed, and placed the order. Within 20 minutes of me placing the order, April at MGI sent me the tracking number. The unit came in a small box, well packaged with a color instruction sheet. Rob, my UPS driver and I looked at each other in disbelief. That’s it? It doesn’t weigh anything! After I removed it from the box I found that is was very light indeed. 1lbs and 11Oz. to be precise. Here is the upper, along with the instruction sheet, as I took it out of the box. This entry was posted on October 8, 2010 by Dan. It was filed under AR15/M16 .